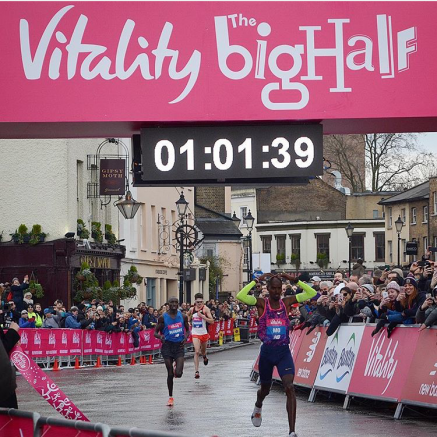 4th March 2018 – In his first race for 6 months Sir Mo Farah (GBR) showed no signs of race rustiness as he took a comfortable victory at the inaugural Big Half in London. The cold and snow that had battered the UK for the previous 3 days relented and the athletes were able to race round the streets of the English capital. The main protagonists of Daniel Wanjiru (KEN) who won the 2017 London Marathon, Callum Hawkings (GBR) fourth in the London 2017 World Championships and Sir Mo were soon to fore and building a lead ahead of the rest of the field. 5k was passed in 14:34, 5 miles in 23:30 and 10k in 29:08 with the three still running stride for stride. Hawkings took responsibility for pushing the pace on but he was not able to lose the attention of the other two and they passed 20k together in 58:35. Then, as the historic Cutty Sark came into view Mo was able to sprint clear and be crowned the first winner of the big half in a time of 61:40. After the race Sir Mo said “It was nice to feel comfortable in myself. I know I’m in shape.” For now it is back to Ethiopia to finalise his preparations for the full London Marathon in seven weeks’ time.